Foolproof and gourmet. Two adjectives not commonly found together. Typically I’m not a fan of ready–mix baking products (the thought of it would make my old culinary instructors cringe), but once in a while you are entitled to a lazy day. 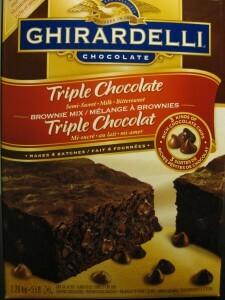 This pouch of brownie mix is so simple. 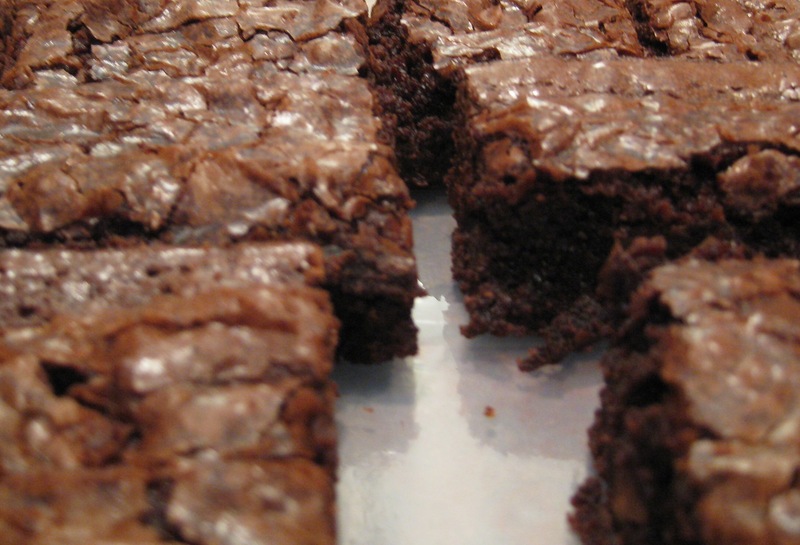 All you need is an egg, oil, water, and the ability to count to 40, that being the number of strokes it takes to mix perfectly textured brownie batter. 40 minutes later and you have rich, chocolaty, chewy brownies that nobody will suspect came from a box. Made with 3 kinds of Ghirardelli chocolate chips; semisweet, milk, bittersweet, these brownies will satisfy any chocolate craving. Although I fail to do this every time, allowing the brownie to completely cool before cutting will prevent it from falling apart. Available at Costo. I have always been a fan of The Cheesecake Café. Their cheesecakes are conveniently available for take-out when I get that craving for something sweat and creamy. During my most recent mission to satisfy my sweet-tooth, I discovered a new unique flavor of cheesecake worth sharing. At first site, the odd colors of this cake may bring forth some doubt. Green cheesecake base, white topping decorated with purple swirls is an odd color combination for any sort of dessert, let alone a cake. Never the less, my curiosity got the best of me. “Oh yes. Well actually… I’m more concerned about the lavender part. Is it strong?” The last thing I wanted was my cake tasting like soap, I thought to myself. Was I ever glad to have taken her opinion. 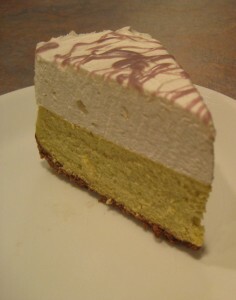 This perfectly balanced subtle blend of green tea and cream cheese has made it as my favorite cake from Cheesecake Café, even better than the Cherry Champaign flavor (October feature cake for the Canadian Breast Cancer Foundation). I was concerned at first that the large portion of white topping would be too much and too sweet, but it turned out to be a light fluffy meringue-like texture. It matched very well its lower half, and also made the cake feel less heavy. As for the lavender, I couldn’t even taste it. Things that look scary can taste good. When the snow starts to melt, Edmontonian’s know it’s their cue to fire up the BBQ (if you haven’t already been barbequing all winter!). This easy recipe is perfect for everything on (and off) the Barbie from burgers to steaks to a simple toasted baguette. I especially love to dollop a heaping spoonful on my steak. The flavors are so robust I find that the steak itself doesn’t even need to be seasoned or marinated. Adapted from William Sonoma – New York. In a large sauté pan over medium heat, melt butter with olive oil. Add onions and cook, stirring occasionally until tender and translucent, about 10-15 minutes. 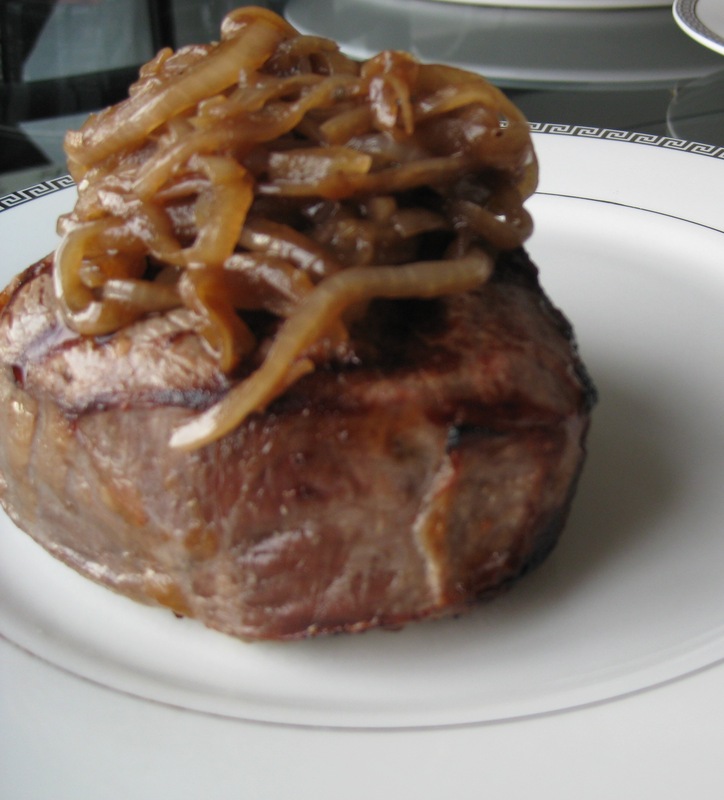 If onions begin to brown, reduce heat. Stir in vinegars, brown sugar, and 2 Tbsp of water. Season with salt and pepper. Reduce heat to low and simmer until the onion mixture has a jam-like consistency, 15-20 minutes. Add more water if onions are sticking to the pan. Taste and adjust seasoning. The sign outside of Barb and Ernie’s speaks the truth. They do have one of the city’s best Eggs Benedict. There are a couple of factors that make it the best: portion size; real hollandaise sauce; atmosphere. Let’s start with portion size. 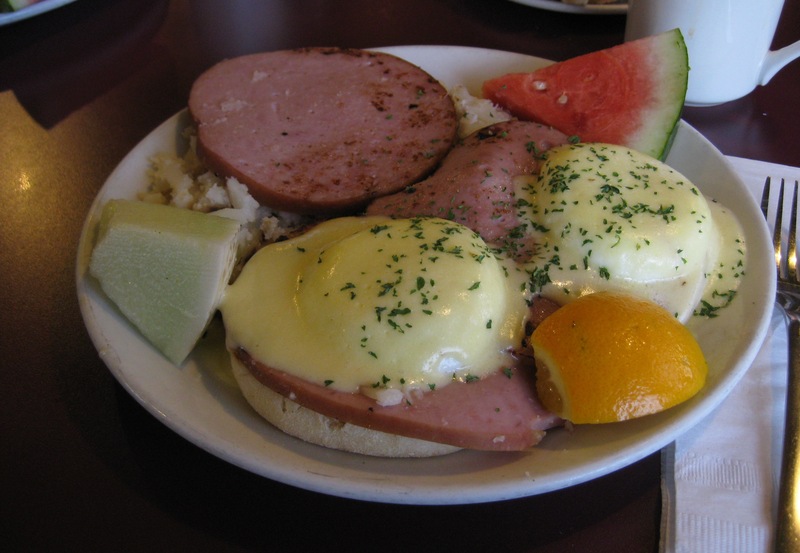 The traditional Eggs Benny boasts 2 English muffins stacked with ham, poached eggs and hollandaise, plus a generous third slice of ham that rests on top the hash browns. I’ve finished it all once…well maybe minus a few potatoes. Lunch was not required that day, and dinner was hardly a necessity. Fruits are also nearby to help re-stimulate the appetite. Next is the hollandaise sauce. It’s not the scary bright yellow-orange stuff you see at most breakfast joints. This is the real deal. All the key authentic flavors of white wine and vinegar are present. This sauce is definitely a heart stopper. Literally. Point #3 is the real reason why I keep going back to this quaint little house. The décor is cozy and homely. Ernie is always busy greeting his customers, always dressed in traditional lederhosen, always cheerful and vibrant. Eating my breakfast there always puts me in a great mood. For these 3 reasons I will return again and again. Thanks Barb and Ernie!